Matossian Eye Associates now offers you the ability to request an appointment from the comfort of your home. You can visit our patient portal at www.matossianeye.com to set up your account. This is a free, secure option to request an appointment from your doctor while in the comfort of your home or office. • Go online to: www.matossianeye.com and select the "Patient Portal" button at the top right of the page. • Select "Request Appointment" and create a secure account. Cynthia Matossian, MD was selected as a Top Doctor in New Jersey once again! ​To see Dr. Matossian's listing, please click here. as faculty at Ocular Surgery News Meeting in New York City, New York October 23-25. Dr. Matossian presented a lecture entitled "Supra Capsular Cataract Disassembly Technique," and another entitled "Flip & Slice Challenges," addressing nationally located eye care professionals. 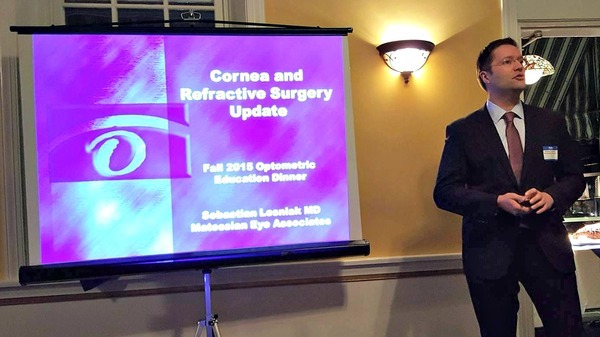 Lesniak, MD spoke on "Cornea and Refractive Surgery Update." 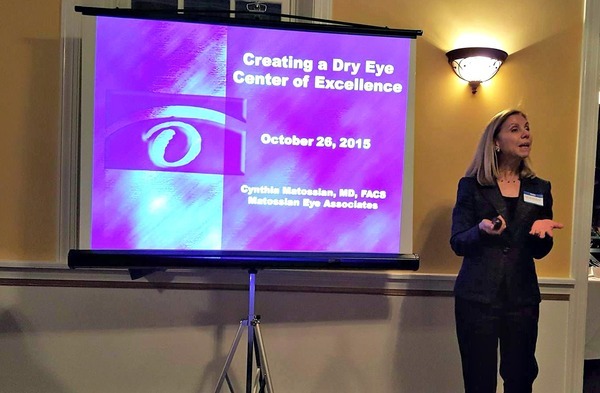 Cynthia Matossian, MD, FACS spoke on "Creating a Dry Eye Center of Excellence." This event was very well received, and MEA looks forward to offering local optometrists future continuing education opportunities in 2016. Stay tuned! Diabetes is the leading cause of vision loss among adults age 20 - 64 in the US, yet 90% of diabetes-related vision loss is preventable. Unfortunately, Americans at higher risk for diabetes have the lowest awareness of diabetic eye disease. During National Diabetes Month this November, Matossian Eye Associates is reminding people about the importance of getting an annual dilated eye exam, especially persons with diabetes. Diabetic Retinopathy affects 28.5 percent of people age 40 and older living with diabetes. It occurs when the small blood vessels in the eye change by swelling, leaking fluid or closing off completely, blocking blood flow from reaching the retina. In its earliest stages, diabetic retinopathy does not have symptoms. Cataracts occur when the eye’s lens becomes cloudy, causing vision to become blurry or dim. While this happens in many people as they age, those with diabetes are more likely to develop cataracts than their peers without diabetes. Glaucoma is a disease that damages the optic nerve and peripheral vision. The damage to the optic nerve is usually caused by elevated pressure in the eye. People with diabetes are more likely to develop glaucoma, which rarely has any noticeable symptoms in its early stages. 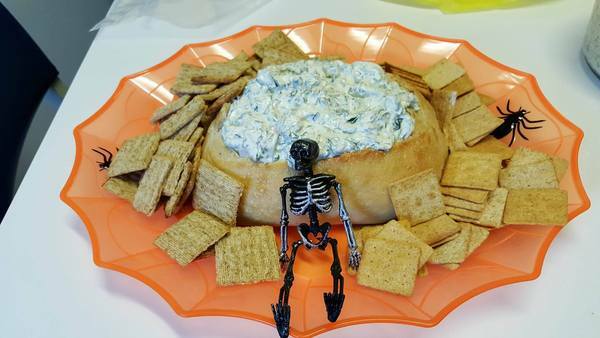 Matossian Eye Associates hosted a Halloween Potluck Lunch for our doctors and staff. 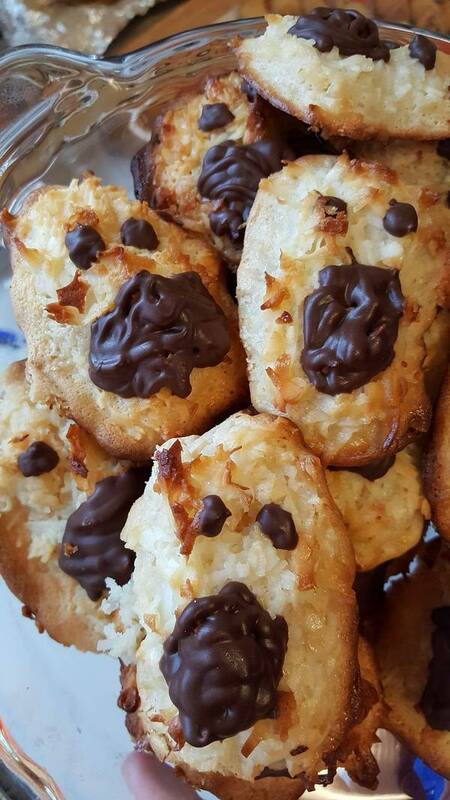 The pictures below include some of the foods that were contributed by the attendees! 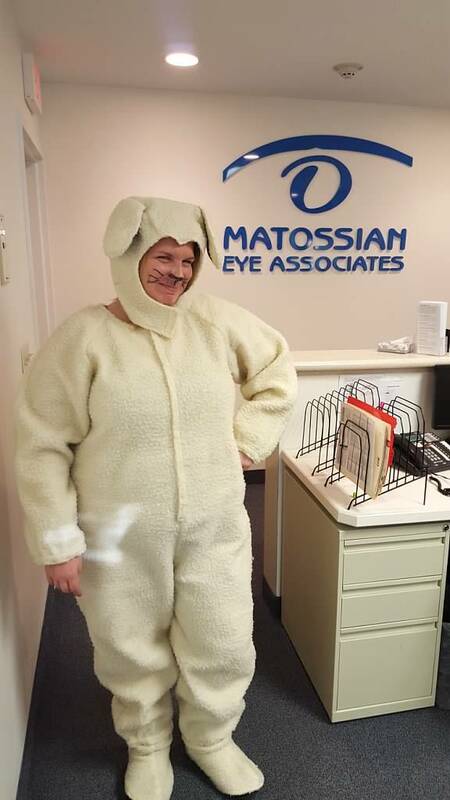 Matossian Eye Associates holds an annual Halloween Costume Contest for the staff the Friday before Halloween. 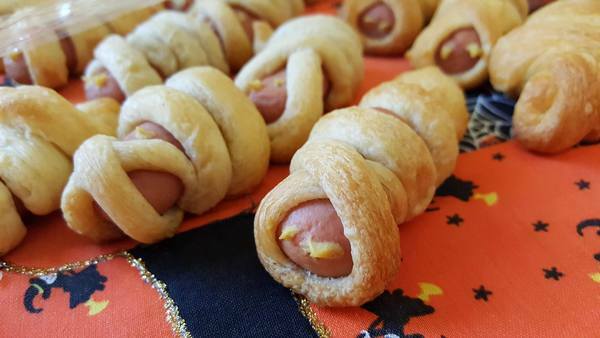 We saw so many great costumes in NJ and PA, and everyone got into the Halloween spirit! Take a look at some of the great outfits from our competition and the winners below! The winner in PA, Abby! The winner in NJ, Laura! 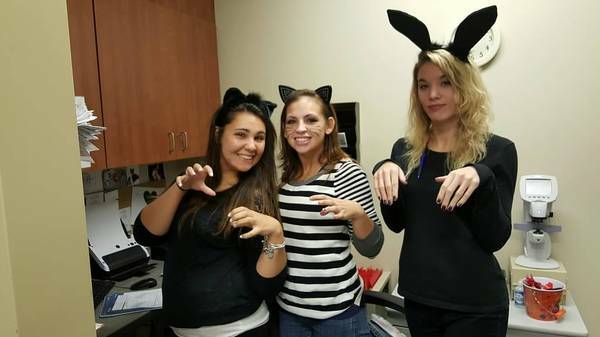 Hopewell Ophthalmic Techs looking cute and cuddly! Doylestown tech Jen looking magical as Hermione Grainger! 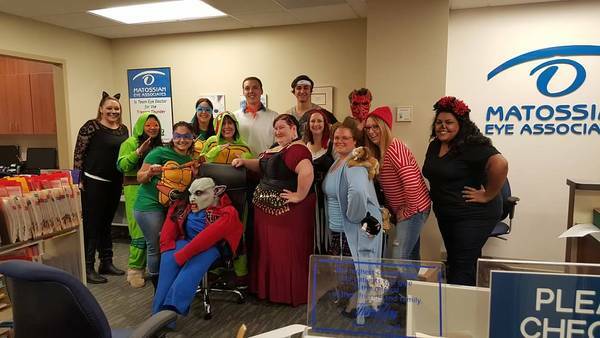 The Billing Department as the Teenage Mutant Ninja Turtles! 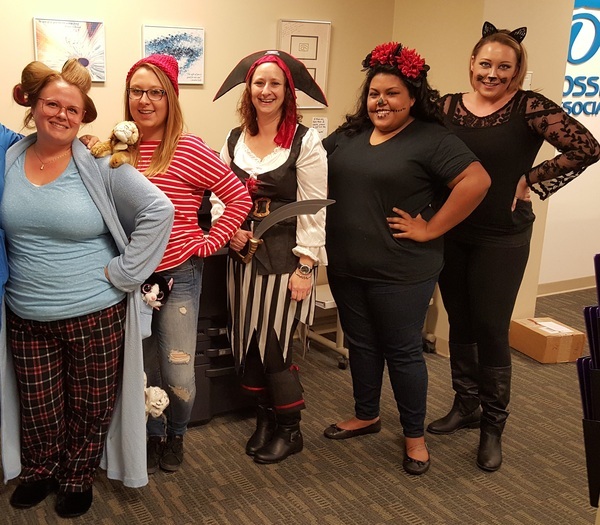 A group photo of the Doylestown Front Desk Ladies! Cynthia Matossian, MD, FACS was honored to receive her Cataract Certification from The American Board of Eye Surgery. She received her letter of recognition from Gilbert Wheeler, the Executive Director of The American Board of Eye Surgery which can be viewed here. 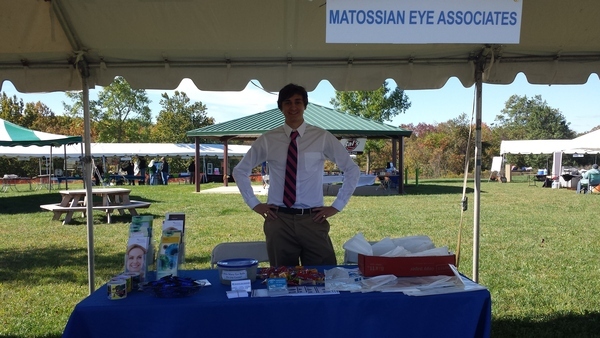 Matossian Eye Associates is active in the Mercer County, NJ and Bucks County, PA communities, offering vision screenings, information on eye health, and educational lectures at many local health fairs and community events. 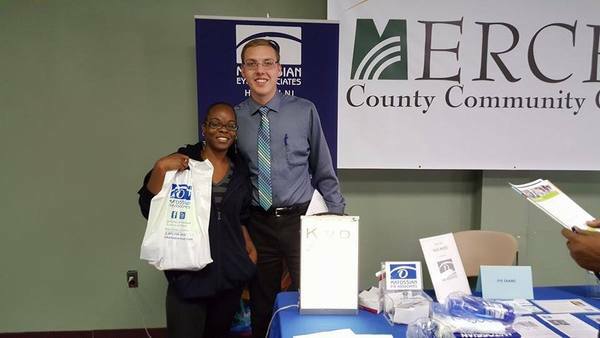 Marketing Coordinator Dan Rue with a student at Mercer County Community College's health fair. 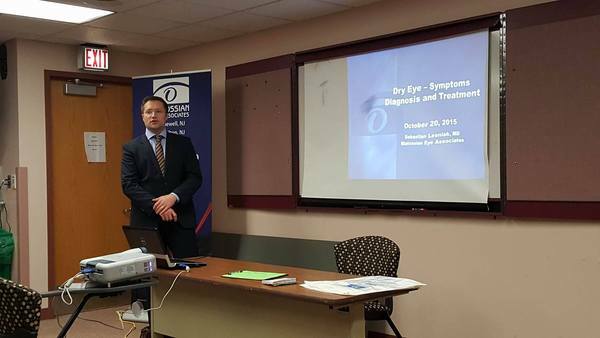 Sebastian Lesniak, MD gave a lecture to the FMS support group at the Doylestown Hospital on dry eye. Marketing Coordinator Dan Rue was at Rider University's Faculty and Staff Health Fair. 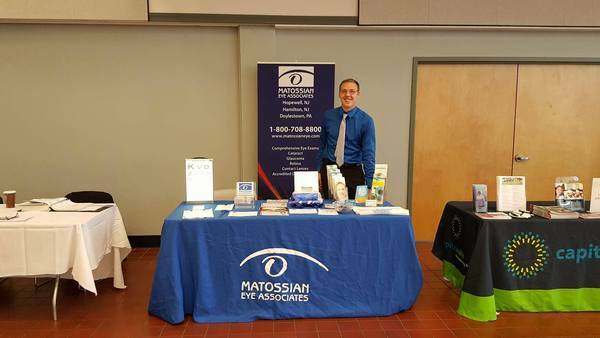 Special Projects Person Mitch Helmlinger with Ophthalmic Assistant Kelly Gallagher (not pictured) were at Warrington Community Day in Warrington, PA.
MEA's Hannah Woytowicz passed all the necessary exams and is now a Certified Ophthalmic Assistant. Congratulations to Hannah! MEA's Sera Marshall passed all the necessary exams and is now a Certified Patient Service Specialist. Congratulations to Sera! Cynthia Matossian, MD, FACS will present a continuing education webinar series entitled "Surfacing on the Web." This series contains two parts, "Dry Eye in Special Populations" and "Perioperative Practices: Managing the Ocular Surface" and will be broadcast to a national audience of ophthalmologists and ophthalmic technicians in December. Cynthia Matossian, MD, FACS presented on "Sjögren’s Disease and Diagnosis with the Sjö® Diagnostic Test" to a group of ophthalmologists and ophthalmic technicians in November. Cynthia Matossian, MD, FACS lead two national live webinars entitled "The Chronic and Progressive Nature of Dry Eye Disease (DED): It’s Time to Think Differently About DED" in October and to a group of ophthalmologists and ophthalmic technicians in November. 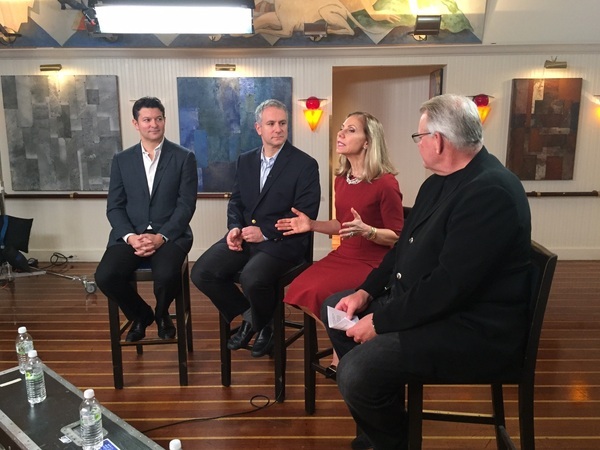 Cynthia Matossian, MD, FACS presented on "Flip & Slice Challenges" and "Supra Capsular Cataract Disassembly Technique" at the national meeting OSN NY 2015 in October. Cynthia Matossian, MD, FACS presented on "A Novel Advance for the Prevention of Miosis and Reduction of Post-Operative Pain in Cataract Surgery or IOL Replacement" to a group of ophthalmologists and ophthalmic technicians in October. Cynthia Matossian, MD, FACS lead a national live webinar entitled "Osmolarity and TearLab: Practical Applications" in October. ​​Cynthia Matossian, MD, FACS wrote the article, "Nonadherent? Let's List Why, When...," published in the November 2015 issue of Ophthalmology Management. Please click here to read the article. Cynthia Matossian, MD, FACS contributed to the article, "Surgeon Explains Flip-and-Slice Supracapsular Cataract Disassembly Technique, " published in the October 2015 issue of Ocular Surgery News, U.S. Edition. Please click here to read the article. Cynthia Matossian, MD, FACS penned the article, "Short Course of Steroids May Improve Outcomes for Dry Eye Patients," published in the October 2015 issue of Ocular Surgery News, U.S. Edition. Please click here to read the article. "Morgagnian Cataract: A Tale of Two Cases," published in the October 2015 issue of Cataract and Refractive Surgery Today. Please click here to read the article. Cynthia Matossian, MD, FACS contributed to the article "Real-World Simulation Shows Patients They Need Cataract Surgery," published in the October 2015 issue of the Ophthalmology Times. Please click here to read the article. Cynthia Matossian, MD, FACS contributed to the article "Integrating Premium Services Into Practice" published in October 2015 issue of EyeWorld. Please click here to read the article. Cynthia Matossian, MD, FACS penned the article, "Pearls from the Deep," published in the September 2015 issue of Advanced Ocular Care. Please click here to read the article. Back Row - Sebastian Lesniak, MD; Ilya Rozenbaum, MD; and Priya Desai, MD, MBA. Front Row - Rebecca Posner, OD; Hetal Diwan, OD; Cynthia Matossian, MD, FACS; Hilary Brader, MD; Jennine Lutz, OD; and Jennifer Viscusi, OD.